Together we can create a better us! The Y. For A Better Us. Annual Sustaining Campaign for the YMCA of Northwest Louisiana. The YMCA’s Annual Sustaining Campaign provides financial assistance for YMCA memberships, program participants of all ages, and underwrites YMCA operational expenses, so that everyone has the opportunity to learn, grow, and thrive through the Y. Everything we do helps strengthen our neighborhood and the people who live here. Every day, our community faces new challenges that create a greater need for the work we do. And we need your help to do it. Your gift can help Northwest Louisiana and everyone in it, shine. The YMCA of Northwest Louisiana is a 501(c)(3) organization; this donation is fully tax deductible. Donations of all amounts help support our mission. 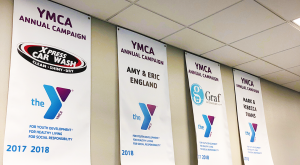 All donors over $1000.00 will be recognized with an Annual Campaign Community Partner banner within the Y branch of your choice.